Toronto's Troy Bodie celebrates after scoring on Coyotes goalie Mike Smith during the first period Thursday in Toronto. The Maple Leafs won 2-1 in a shootout. TORONTO — James van Riemsdyk and Joffrey Lupul scored in the shootout and the Toronto Maple Leafs beat the Phoenix Coyotes 2-1 on Thursday. Troy Bodie scored in regulation and James Reimer made 34 saves for the win, just the Leafs’ second in their past seven games. Martin Hanzal scored for the Coyotes and Mike Smith made 26 saves. Unlike in their previous loss to the Florida Panthers, the Leafs didn’t spend so much time hemmed in their own zone, and when they did, Reimer was there to make timely saves. After a day off, Leafs players got to the rink and met with the coaching staff and head coach Randy Carlyle, who spent eight hours at the rink Wednesday trying to find some solutions. "We formulated some form of a plan that we presented to our players this morning," Carlyle said Thursday morning. "We think there are some things that we can hang our hat on that if we continue to get this group to commit to playing a more aggressive forecheck, a more aggressive defensive zone that the tide will turn in our favor." An aggressive forecheck contributed to the Leafs’ first goal as Bodie and Peter Holland got into the offensive zone and made something happen. Defenseman Cody Franson’s shot bounced off Smith’s pads, and Bodie was there in front to collect it and slide it in between his legs along the ice 15:52 into the first period. It was Bodie’s first goal in 13 games this season, his first with the Leafs, and his seventh in 120 career games. For much of the rest of the game, the Leafs improved their defensive aggressiveness and avoided taking too many ill-advised penalties, and it looked as if Bodie’s goal would stand up. 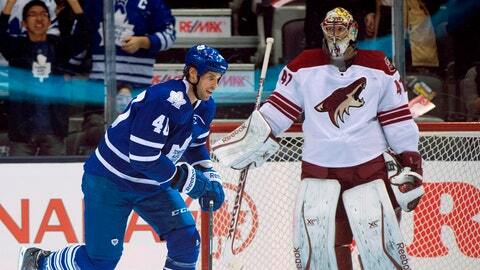 But Hanzal broke up Reimer’s shutout 15:08 into the third. With the Leafs’ top defensive pairing of Dion Phaneuf and Carl Gunnarsson on the ice, Hanzal got the puck from Rostislav Klesla behind the net and scored on a loose wrap-around.